When I was growing up, my grandmother had a copy of The Annotated Alice, with annotations by Martin Gardner. I found it incredibly fascinating, and I later read his Annotated Hunting of the Snark as well. I don’t think I’d read any of his other annotated volumes, but I recently decided to rectify that. 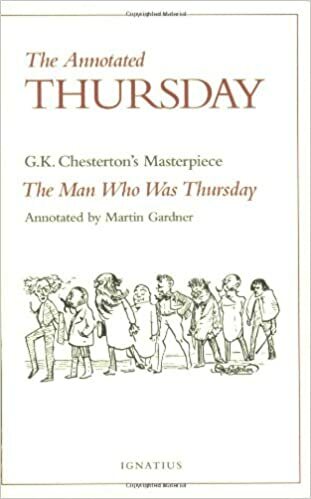 The Annotated Thursday – I’d read G.K. Chesterton’s The Man Who Was Thursday online not too long ago, and I wasn’t sure I really got it. I mean, I knew what was happening in the story, but not necessarily what Chesterton was trying to say. From what Gardner said, the main idea is basically that of Nature as separate from God. Chesterton, a Christian apologist (best known as Catholic, but Anglican when he wrote the book), holds that nature can be chaotic and capricious, but there’s ultimately a divine plan behind it. The story is pretty interesting even if you don’t share Chesterton’s theology (which I don’t think Gardner did), basically the story of a policeman who infiltrates a group of anarchist terrorists, only to find that all of the other members are ALSO undercover cops. Well, except for one actual terrorist, who is used as a symbol of Satan. It’s sort of a response to the stories where the protagonist gradually finds out that everyone they thought was a friend is actually an enemy. Aside from the exploration of the main theme, many of the annotations were simply aimed at explaining the specifically British references to non-Brit readers, although others detailed possible influence from mystery and spy stories Chesterton might well have read. 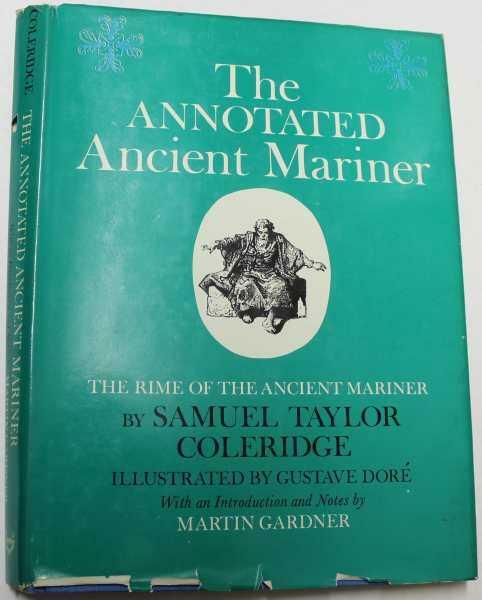 The Annotated Ancient Mariner – I’ve written before about Samuel Taylor Coleridge’s Rime of the Ancient Mariner, which really first came to my attention when it (along with Coleridge’s Kubla Khan) played a major role in Douglas Adams’ Dirk Gently’s Holistic Detective Agency. It’s a poem about a sea captain who’s forced to live indefinitely in a cursed state after killing a friendly albatross for no reason. The annotated edition includes two versions of the poem, the standard and an earlier one, with notes on some of the changes between the two. There’s some exploration of the possible symbolism behind the work, with Gardner indicating that it contains some symbolism but is not an allegory. Just because some elements of the poem stand for other things doesn’t mean they ALL do. Considering his Lewis Carroll fandom, it’s interesting to note that these other works he annotated are also surreal and dreamlike in style. Thursday is identified in the title as a nightmare, and features constant shifts in weather and the like, as well as a direct reference to Alice. Mariner has a ship drifting aimlessly from polar to tropical waters with its captain, the only living person aboard, in a dark daze the whole time. I guess that’s not so much the case with, say, “Casey at the Bat,” which I understand he also annotated. I had a bizarre dream last night that included an elevator making all sorts of weird contortions around a building, and I’d say it belonged in a narrative if it weren’t for the fact that it was basically Willy Wonka’s Great Glass Elevator. This entry was posted in Authors, Christianity, Dirk Gently, Douglas Adams, Dreams, Lewis Carroll, Poetry, Religion and tagged annotations, g.k. chesterton, martin gardner, samuel taylor coleridge, the annotated alice, the annotated ancient mariner, the annotated thursday, the hunting of the snark, the man who was thursday, the rime of the ancient mariner. Bookmark the permalink.